I'm sorry my friends that I've been a little slacker in the blogging world lately. 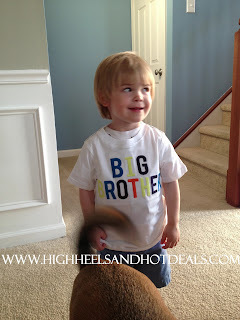 That's right Cohen - you're going to be a BIG BROTHER! Let me just say that in my case there are no two like pregnancies And whoever said morning sickness happens in the morning obviously never experienced it -- more like morning, noon and night plus in your sleep. Thank God for Zofran. I hope to have more baby product reviews, pregnancy tips and photos throughout my journey with Bambino #2. However, I'm not going to lie, I keep having newborn flashbacks and then end up having mini panic attacks. So here we go on this new adventure -- just six months left until we're joined by a new little one! Congrats! Looking forward to more posts in the future, but I totally understand you being MIA... in our house, we say that family trumps everything else. he is so so so cute!!!! Congrats! I hope you feel better soon. Congratulations! Zofran is the best thing ever! My husband had to pick it up at the pharmacy for me the first time and the pharmacist warned him that I would leave him for it ;-). It's so great that I call it my happy pill. I hope your feeling better soon! What a cutie, and congrats! Congrats! That's so exciting! I hope you feel better soon! Congrats! Hopefully the "all day sickness" passes soon! I had all-day-sickness-all-pregnancy-long with my first baby and only morning sickness for the first trimester with the second. I hope your sickness passes soon!